This week, the Sun in Libra will continue to weigh the light in the world against the darkness, seeking to regain balance between the two forces. Thus, the light and dark can be felt as being intelligently responsive to one another, each making essential offerings. Bathed in light, the shadows come forth as a theatre of imagination. Under cover of darkness, the light of inner knowing grows brighter. This week will feature planetary aspects to Mercury in Libra and Mars in Capricorn, indicating that both the silver tongue of social grace and the patient hands of a master strategist will be acutely developed by the upcoming ideological climate. By the weekend, there will be a Full Moon in the cardinal fire sign of Aries, an event that will catalyze volatile passions. This Full Moon will be marked by thrashing powers of transformative energy, complete with erratic and volatile jerks of enthusiasm and heated tempers. The planet Uranus, Promethean fire of liberation, will be conjunct this Full Moon in Aries, creating a martial force of reactionary rebellion so electric that the Sun in Libra’s cry for equanimity will be all too easy to ignore. To get a full picture of the week in all of its magnificent colors, I invite you to take a brief glance at the life of the last Ptolemaic Pharaoh of Egypt, Cleopatra. The legend of Cleopatra, her Imperial strength; her cunning wit; and her renowned beauty, will open a wide window to imaginative history where the wisdom of the ages may speak more clearly. Perhaps the most legendary woman to have ever lived, Queen Cleopatra VII was ruler of Roman occupied Egypt for twenty-two years. The Egyptian capitol, Alexandria, was the crown jewel of the Ptolemaic Dynasty of Greeks who had ruled Egypt for centuries. It was there that she received her incomparable education the minds that circulated through Alexandria’s famed Museum and Library. Cleopatra grew up in the turbulent times of this empire’s decay and was thus the last of Hellenistic rulers. Born a generation before Christ, as a child, Cleopatra was worshipped as a manifestation of Isis. At 18 years old, she ascended to the throne to rule the eastern Mediterranean coast and all of its immense wealth. 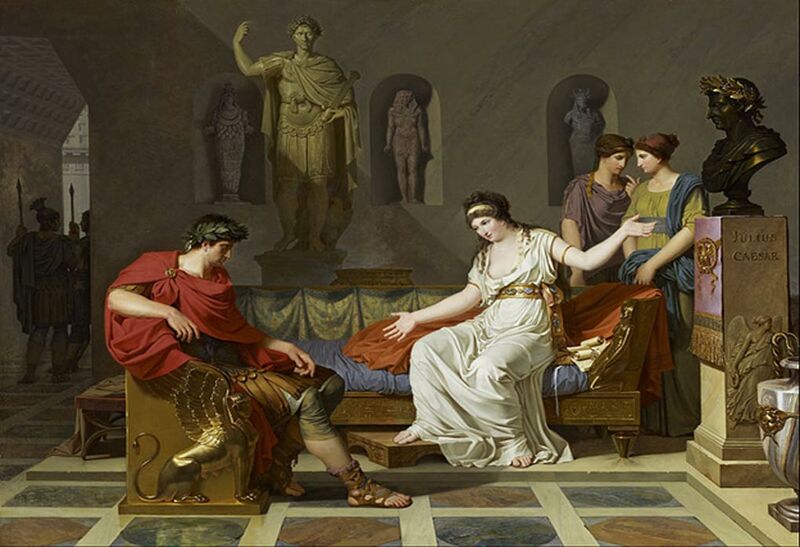 In beauty, education and riches she outshone even her immensely powerful lovers: Julius Caesar and Marc Antony. Often called the consort of these Roman leaders, for a time her power was secure in the fact that it was Rome that needed Egyptian grain. The manner in which historians portray Cleopatra is dependent on their own psychological and political biases. Any pro-Roman slant will paint a portrait of an ambitious courtesan, as heartless as she is seductive; beguiling and bewitching. 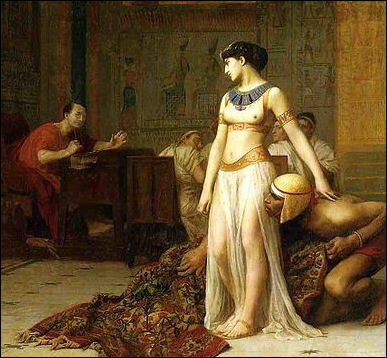 But any historical perspective that values the sanctity of Alexandrian Egypt’s last fragrant moments will see Cleopatra as Shakespeare did: mellifluous , passionate and tragic. On Tuesday, the planet Mercury will conjunct Jupiter in Libra. When the planetary cycle of intelligence meets the planetary cycle of wisdom and expansion, there will be a vast opening of mind that will lead you towards an optimistic view of humanity. The long hallways of history will be lit up, revealing the humor in the truth that there is nothing new under the sun. Fear will dissipate under this influence in light of this vision of narrative cycles that rise and fall on joys and sorrows in perfectly equal measure. Your love and devotion to others will be accentuated and your world-view will become illuminated by your goodwill, lending your thoughts and speech a melodious tone of genuine kindness. Also on Tuesday, Mars in Capricorn will sextile Neptune in Pisces, increasing your power to use mystique and allure to gain favor and make lasting impressions. Imagine the story of Cleopatra’s pearl, which combines cunning strategy with the highest art of seduction. This act used the art of implicit sexuality to dominate Marc Antony completely, enslaving him with desire. 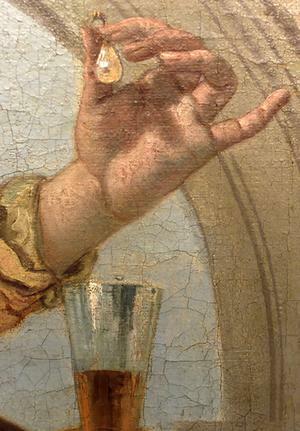 Not even a great leader of the Roman Empire could afford to dissolve and drink rare pearls. 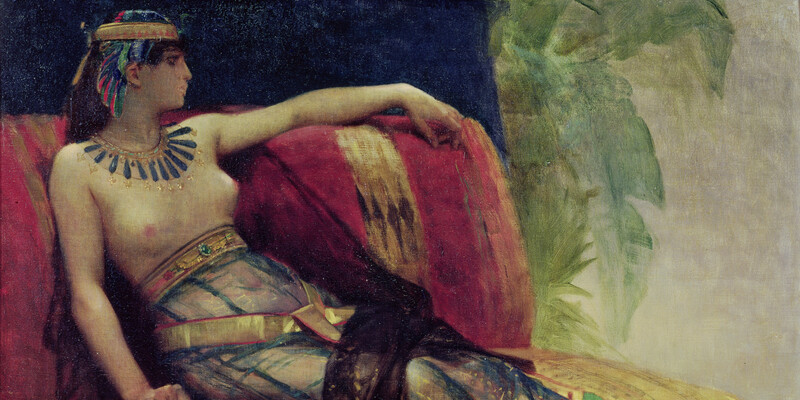 Though Cleopatra was noted as a wise stateswoman and a gifted conversationalist, she sent an even more powerful message about her position of power without saying a word. This story of Cleopatra’s pearl is one you can imagine to grasp the image of the power one might draw upon when the military might of Mars in Capricorn makes a supportive aspect with the pearlescent dreaminess of Neptune in Pisces. During the middle of the week, Mercury in Libra will square Mars in Capricorn creating moments where some of your assumptions may lead you astray. The more we allow our thoughts to become disengaged from concentrated deliberation, the bigger the margin of error becomes. Thus, if you are still elated by the many uplifting moments experienced during the beginning of the week, avoid conflict during the middle of the week by practicing some real critical thinking. Consider the following question for guidance on how to navigate this transit most successfully. Where are you most vulnerable to flattery? Give this great consideration, as though an entire Empire were dependent upon your nuanced understanding of potential manipulation that could be used against you. But is it possible that Cleopatra could wield so much power in the arts of flattery if she herself was not vulnerable to it? Surely somewhere in the bliss of goddess-hood, royal pride, and world famous beauty, she had a few weak spots. Her susceptibility to flattery through an unerring belief in her own divinity was certainly a factor in what led to losing the war with Rome. Her poetically tragic suicide following the war is the final exclamation mark upon this tale of woe. The weekend begins with significant Mercurial influences which then bleed into the Full Moon in Aries where all will become a torrential storm of chaos, fighting to return to order. With Mercury in Libra sextiling Saturn in Sagittarius, good judgment and deep thinking will be at your disposal. This profound insight and talent for applying effective tactics to create solutions to your problems will be very useful at the Full Moon which will summon up your lust for power. Before you cringe in denial of any lust for power, consider the meaning of power which is to be able to influence people and events. Though this can easily get out of hand and become maniacal, the actual desire for power is natural to all human beings since we thrive on imagination and social relationships. Playing with power is a part of life. Taking risks are required of anyone who wishes to grow and power only grows as you experiment with it. For instance, both Cleopatra’s power and beauty were acknowledged to have grown substantially from the time that she knew Caesar to the time that she became Marc Antony’s lover. 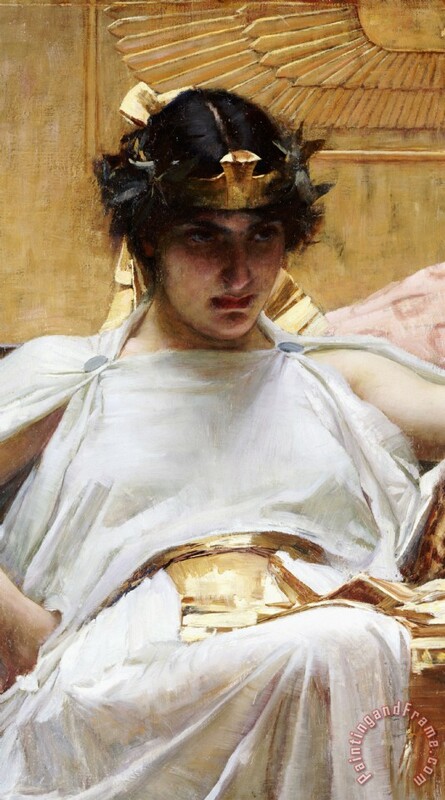 Though Cleopatra’s ultimate goal to resist Roman power ended in failure, she nevertheless maintained her strength, not allowing herself to be triumphed over. Perhaps Rome was inevitably going to win, and in that knowledge, Cleopatra’s resistance was a wild success. …could not but admire the greatness of her spirit. So, use this Full Moon in Aries to take determine where you might develop more influence over people and events. It does not have to lead to corruption and ruination. Though it is not likely that your situation is as dramatic as the last Queen of Hellenistic Egypt, there is still much inspiration that you can take from her story. In the face of the forces that seek to rob you of your peace, be like a wise sovereign. From this position of power, let the magnificent narrative that is your life unfurl.